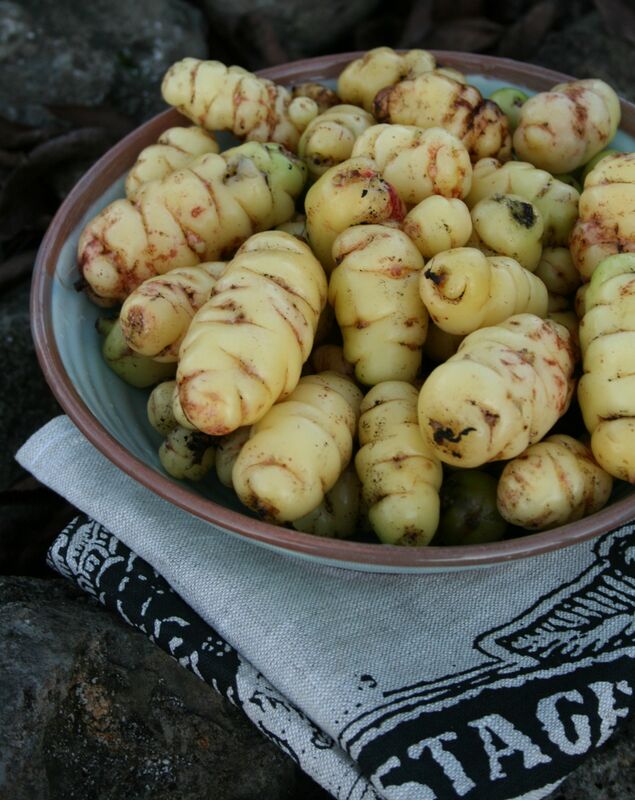 Buried treasure: ‘Inca Gold’ yams. We’ll roast them with honey and orange juice. Looks like we’re in for a couple of wild days of weather – it has been bucketing down for 36 hours and shows no sign of relenting. The stream through our swamp is now a raging torrent, the cats are refusing to put a paw outdoors and I can almost guarantee that our sheep will no doubt choose today to start lambing. Luckily, we made good use of the fine (albeit grey) day on Saturday. Jason hoed over a good sized chunk of my vege patch and Mum helped me sow and transplant several rows of strawberries, peas and broad beans. Lucas helped too, if you call flinging dirt about and stealing my trowel help. Last year I had two rows of ‘Camarosa’ strawberries in this particular corner of the garden. Now I have four; we divided up the crowns and replanted them in fresh mounds of soil enriched with a bag of strawberry food. Bless ‘im. I’ve clearly forced him to eat enough Jerusalem artichokes this winter to last a lifetime. The Shirley poppies and Calendula plants, are they there as a food source, companion plants or to look pretty and attract the bees? I like to put in a row of flowers for every few rows of veges. I suppose I could claim that it’s to bring in beneficial insects, bees and butterflies… but I’d be lying. I just do it to make the garden look nice in summer. Plus I find that if you whack in a row of seedlings between rows of seeds, you can look back at the end of the day and feel like you’ve made a bit of progress (and not just that you’ve dug over a vast expanse of dirt). I’ve never managed to grow decent yams before – mine have always ended up the size and shape of marbles, rather than giant huhu grubs. Though I always tend to plant them in places that subsequnetly get smothered by other plants over summer. Hi Lynda, raining Sunday & Monday in Kerikeri too. I used Calendula seedlings to mark rows of garlic but something has eaten most of the leaves – just left the “rib” down the middle. Plants were under wire netting and the vege garden is rabbit proofed so maybe slugs? Wet weather jobs – Hubby made me 3 huge compost bins from wooden pallets. Plus I finally got my birthday present 2 wooden obelisks, Gorgeous and definitely worth the wait (plan was in NZ Gardener Magazine). Wet weather jobs for me – make 8kg of frozen tomatoes into sauce/chutney. Look on the bright side when it rains there are no frosts for you but would someone please tell it to stop raining now. Wow, Lynda, what a hive of industry! All I can boast is still having fresh basil and mint. I experimented a couple of months ago by buying some hydroponic, supermarket basil and mint plants (cheaper than the garden centre), potting them up in big pots and putting them on a sunny windowsill, where they grew well. As winter approached and the temperature dropped, I started pulling one side of the thermal-backed curtains around the two pots at night, leaving the rest of the window uncurtained. When the sun rose, the herbs got some light until the temperature and I rose to draw back the curtain and let in full daylight. To my surprise, both herbs continued to grow and neither has gone to seed. The recent week of cold weather has finally cheesed off the basil, which is ready for euthanasia, but and the mint is definitely thriving! I, like you have only ever grown ” red marbles! !” , so will have another go in a tub, named, so they won’t be lost. Wish I was your age again with all that energy. Your garden is going to be a picture. We only have Kale, silver beet, strawberries, thyme, mint ,sage and nz spinach ,beetroot and runner beans ( hope they will re grow again),and carrots at the moment. Honey and orange juice on your roasted yams sounds ”YUM” I do carrots in honey and lemon juice. Gay. Have not managed to grow yams here in Queensland, but discovered I have a great crop of turmeric under the soil, dug up this week. Hooray. Now , how do I use i cooking and what recipes? I have only ever used (bought) ground turmeric.